In March 1985, the SLOOC produced 27 pictograms to be used for the Seoul Asian Games and the 24th Olympic Games. Following the Asian Games, however, the SLOOC decided to develop new creative Olympic pictograms, clearly distinguishable from those used in past Games, so as to emphasize the refreshing image of the Seoul Olympics. The work on the pictograms started in December 1986, and 30 draft pictograms were produced in April 1987, including 23 for the official sports, four for demonstration and exhibition sports, and three for torch relay, marathon, and water polo. After two rounds of screening, the draft pictograms were approved as official pictograms in May 1987. The sports pictograms were distinguishable from the past Games by the division of the composition into trunk, arms, legs and head. The connecting parts for arms and legs were treated in a simple and clear fashion but resembling as close to the composition of human frame as possible. Sports pictograms were also utilized as elements of expression in various public relations and printed materials, including decoration, admission tickets for each sport and posters. 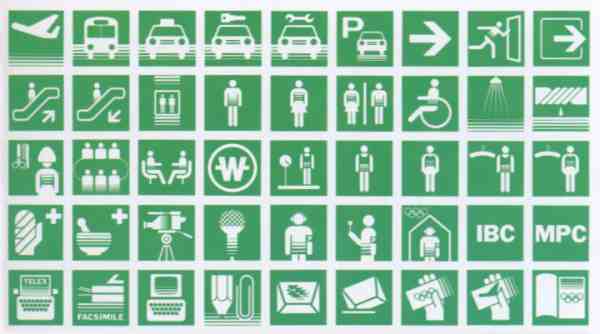 Guide pictograms were used to direct people to amenities, facilities or services. 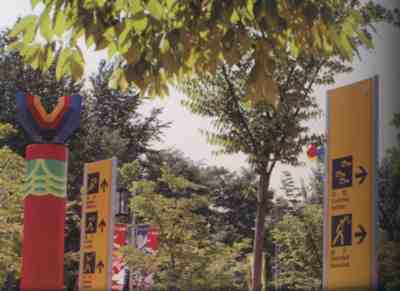 In September 1985, the SLOOC organized an in-house production team to begin the work on the guide pictograms; final designs of the guide pictograms covering 70 types were compledtd in January 1986, and were used during the Seoul Asian Games. In preparation for the Seoul Olympic Games, eight types were additionally produced in September 1987. The guide pictograms were designed in forms to enliven the image of the Seoul Olympic Games and to be easily understood by all concerned.